The file(s) provided above are ZIP-formatted archives, which most modern systems can natively unpack. If your computer does not unpack the archive when you double-click it, you may need to use a separate decompression program such as UnZip. Hurricane Sandy highlighted the invaluable role of community-based organizations (CBOs) in disaster recovery. The RAND Corporation, in partnership with the New York City Department of Health and Mental Hygiene (DOHMH); the University of Colorado — Denver; and the University of California, Los Angeles, conducted a study of the New York City DOHMH Office of Emergency Preparedness and Response's Community Resilience and Recovery Planning committee and its partners to show how partnerships help government agencies, and particularly public health entities, support more efficient and effective recovery. 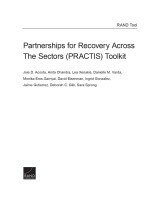 This toolkit, called Partnerships for Recovery Across The Sectors (PRACTIS), leverages the lessons learned from that study and translates them into actionable guidance for local health departments (LHDs). The PRACTIS toolkit can be used to strengthen disaster recovery partnerships between LHDs and CBOs in a community. The toolkit aims to strengthen community-wide disaster response and recovery by offering LHDs three tools: (1) a sample survey and steps for fielding the survey to help LHDs identify the key CBOs that contribute to disaster response and recovery, (2) a quality improvement guide and sample quality improvement report to help generate guidance about the strengths and weaknesses of the partnerships between LHDs and CBOs and between CBOs, and (3) a tabletop recovery exercise that can be used to improve the relationship between LHDs and CBOs. Acosta, Joie D., Anita Chandra, Lea Xenakis, Danielle M. Varda, Monika Eros-Sarnyai, David Eisenman, Ingrid Gonzalez, Jaime Gutierrez, Deborah C. Glik, and Sara Sprong, Partnerships for Recovery Across The Sectors (PRACTIS) Toolkit. Santa Monica, CA: RAND Corporation, 2015. https://www.rand.org/pubs/tools/TL188.html.